At the Sri Ranganatha temple in Srirangam, Vaikunta Ekadasi lasts for 21 days – which is divided into two parts of pagal pathu and Ira pathu. On the Vaikunta Ekadasi day, the most important event at Srirangam is the ‘Sorgavasal Opening’ – Paramapada Vasal - the opening of door to Vaikunta - abode of Srihari Vishnu. In 2020, Vaikunta Ekadasi date is January 6. On this day, Bhagvan Srihari Vishnu is clothed is an armor of pearls and is brought to the Thousand-Pillared Hall from the inner shrine. The idol is brought through the northern gate known as ‘the Gate of Vaikuntha’ or the gate to the heaven. This gate is opened only on the Vaikunta Ekadasi day. The lord holds the Divine Durbar in the Thousand Pillared Hall and Nalayira Divya Prabandham is recited. The Lord returns late in the night. 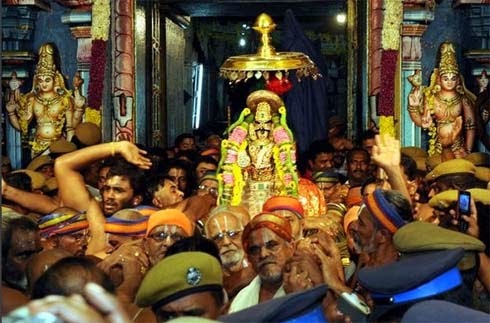 Vaikunta Ekadasi at Sri Ranganatha Temple is observed for 21 days. The ten days before Vaikunta Ekadasi is observed as Pagal Paththu and the next ten days after Vaikunta Ekadasi is observed as Erapaththu. Thiruvaimozhi (One Thousand hymns by Nammazhwar) and Nalayira Divya Prabandham is recited during the 21 days. The Vaikunta Ekadasi festival begins with the recitation of Thirumangai Azhwar's pasurams, ‘Thirunedunthandakam'. Every day, Namperumal is taken to the Arjuna Mandapam in Simha Gati (Leonine Walk). The Azhwars and Acharyas are also brought here from their respective shrines. The Thulukka Nachiyar Sannidhi (The Muslim Princess who became a devotee of Ranganathar) is in the Arjuna Mandapam. Betel leaves and nuts are sent to the Lord from Nachchiyar shrine. The Araiyars present the hymns during day time. Hence these ten days are known as Pagal Paththu. Each day will have a special presentation. On the tenth day, the Lord takes the form of Mohini. Dressed in white silk, with the tresses long and ornamented, the Lord in Mohini Alankaram is a great attraction for devotees from all over the world. On Ekadasi day, the Lord issues forth quite early in the morning (around 4 A.M.). He is decked with jewelled armour which is veiled by a muslin shawl. His garland has tiny parrots, a marvellous art of the garland makers of Srirangam. He is adorned with the Pandian Kondai. The Bhattar Swami is brought in with temple honours. At once, the Arya Bhatal doors are banged shut. Then the Araiyar recites the first verse of Nammazhwar's Tiruvaimozhi. Namperumal leaves the sanctum and comes down the Karpura steps and turns west. This pradakshina is known as Rajamahendran circle. Here, the verses of Pillai Perumal Iyengar are recited. And finally, Namperumal's procession reaches the Paramapada Vasal and its doors are flung open! Year after year, at the scheduled time, Ranganathar helps us cross this door. Issuing out of the door, the Lord moves to the Thousand Pillared Mandapam and ascends the Tirumamani Mandapam. Just as he had held court in the Arjuna Mandapam for ten days, from now onwards, he will be in this mandapa at night and listen to Thiruvaimozhi along with the Azhwars and the Acharyas. Well, he is rightly called Kaveri theera rasika! The Moolavar of Ranganathar is adorned with an armour of pearls on Vaikunta Ekadasi day. The Handsome Bridegroom (Azhagiya Manavalan) is All-Beautiful, a Divya Mangala Vigraha. Salutations to the Lord who never fails the devotee!